Looking for something different to do on the slopes in February? The exhilarating sport of horn sledge racing may be just your speed. 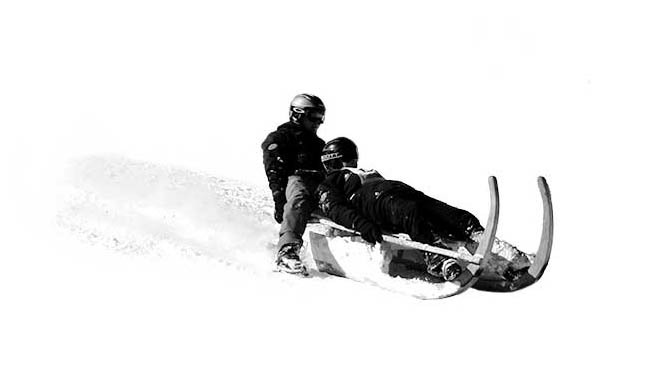 Horn sledges (Hornschlitten, or Horeschlitte in Swiss German), are sledges approximately two metres long, which get their name from the long runners that extend upwards in front, serving as grip handles when pulling the sled along flat areas or sliding downhill. They were originally built to bring summer grass, firewood or logs down from high alpine mountainsides during winter. Unsurprisingly, this was an extremely hazardous activity, the chief danger being the driver getting run over, or ‘eaten’, by the sledge. According to team captain Matthias von Siebenthal, Hornschlitten-Club Gstaad (HSC Gstaad) was founded in 2003 and first held races in Gsteig with teams from all around Switzerland. For the last four to five years, the club has held competitions in Saanenmöser. HSC Gstaad’s racing sledges are more massively built than the originals, better able to handle the vibration and stress of racing. A typical two-person crew consists of a Steurer (steerer) in back, who sits or lays on their stomach and steers with boot pressure, and a Bremser (brakeman) in front, who helps steer by weight-shifting and slows the sled with judicious applications of shoe leather. Speeds up to 96 km/h have been clocked by HSC Gstaad members. On 24 February, 2019, HSC Gstaad will hold their annual race on a new course at the Horneggli, beginning at the Horny-Bar and finishing near the Kuhstall restaurant. Participants aged 9 and over can compete on small sleds (Giebel), and anyone over 16 years can race on Hornschlitten. Bring the entire family and get ready for an awesome day!